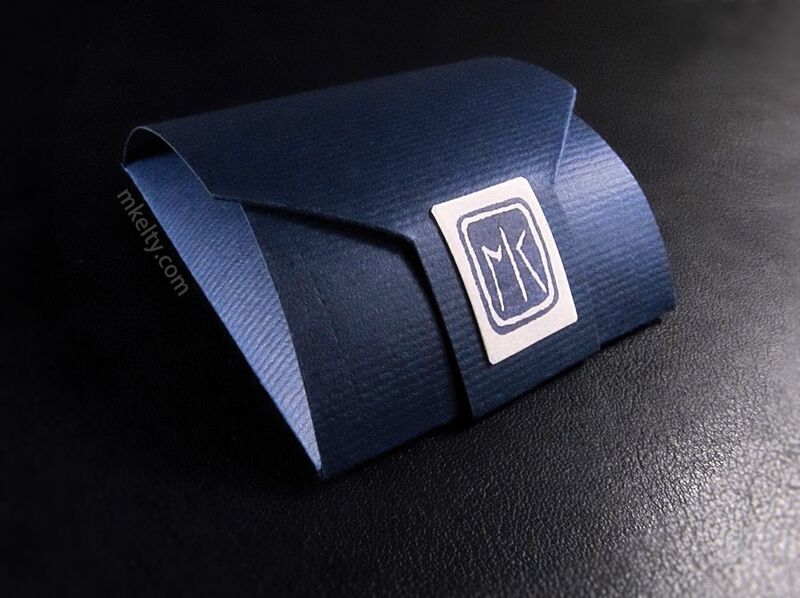 This is the box I designed and hand make, to hold items not mounted on belts. It's made from heavy cardstock...One time use..
1.25" / 38mm Amalfi belt buckle, sterling and gold. 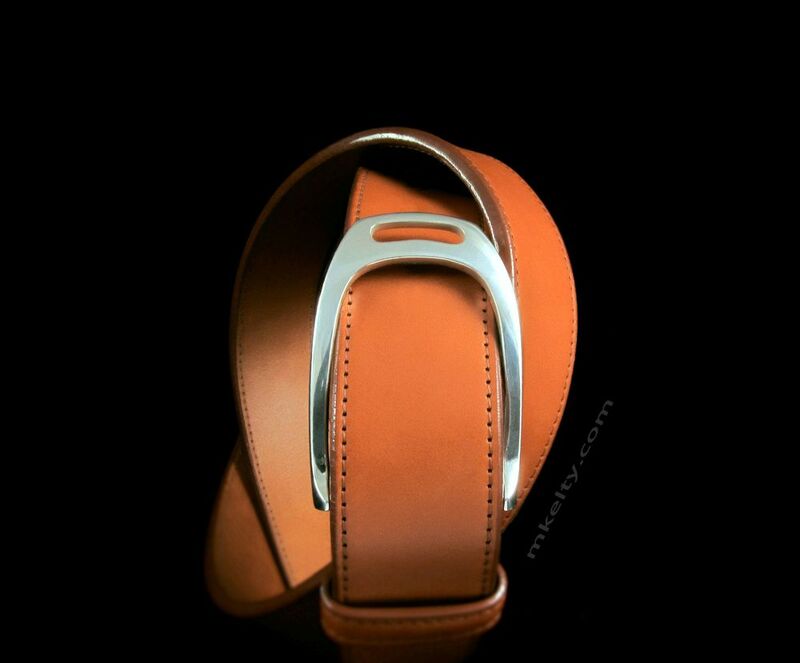 I'm laying in the custom hallmarks on an Amalfi buckle. 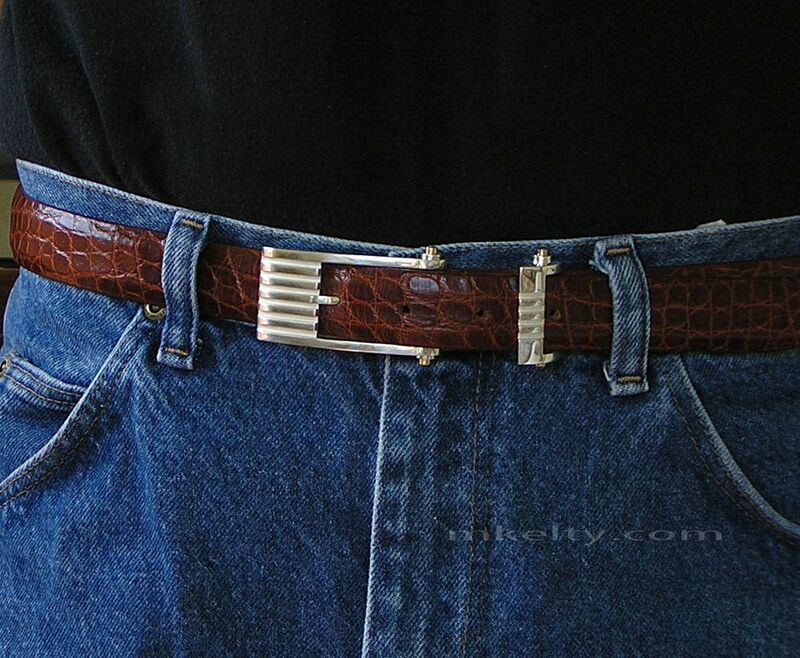 The Manhattan "Special" has always been one of my favorite buckle sets. It's still up on the website, even though I don't offer it as a regular item. I occasionally make one. Please let me know if this buckle is of interest to you. I'm modeling a 1.25" / 32mm, Metro buckle set in sterling. It's mounted on my everyday, lizard work belt. This is the buckle version without the stone mounts. Harness belt buckle set in sterling. This set is available in both 1.25" / 32mm, and 1.5" / 38mm.... 490 USD and 565 USD . The belt is an espresso shark by Wm. Julian Design. Custom Bentley sterling belt buckle set..hammered, custom hallmarks and a custom keeper....Base Bentley buckle, 1" / 25.4 mm....starting at.... 375 USD. Custom keepers.... start at.... 290 USD. Catalina sterling silver belt buckle with 14K gold overlays, 1.125" / 28.5mm.... starting at.... 750 USD. This buckle is available in 1 inch / 25.4mm, and 1.25" / 32mm . 1.125" / 28.5mm, one-off, Catalina sterling buckle. 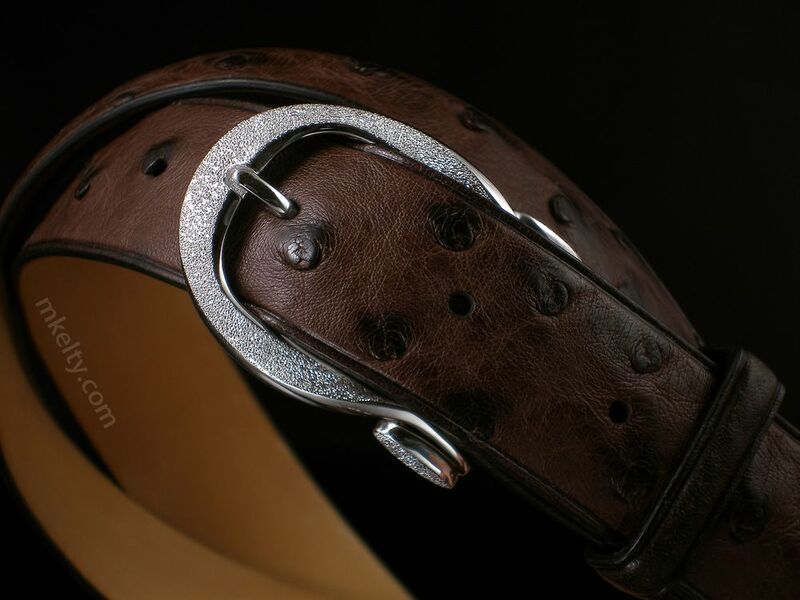 The tops of the buckle and lugs are textured with a special diamond tool that impacts the surface, leaving tiny reflective points that resemble micro-pave. The buckle was then rhodium plated to preserve the finish. 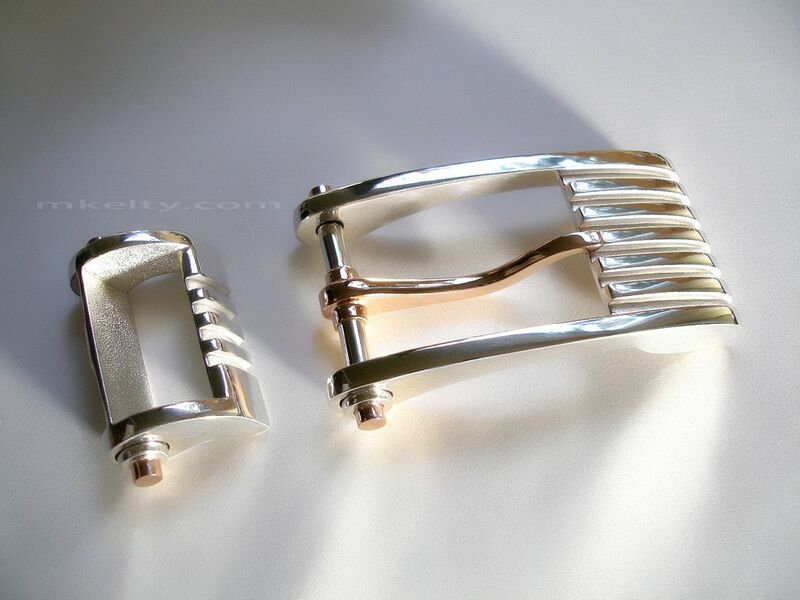 Two of three, matching, Catalina "Special" buckles, I made for one of my favorite clients. 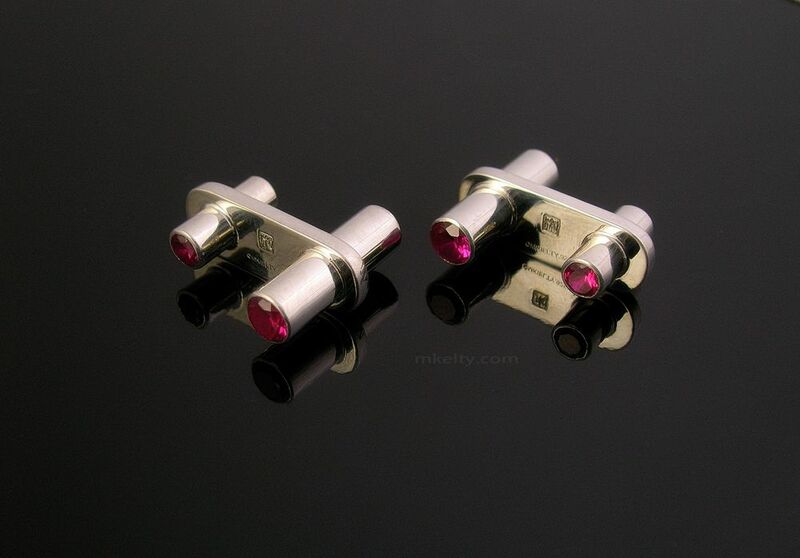 They have 14K pink gold tongues, lug overlays and hallmark plates. They were cast in a special silver alloy I can't access anymore...so they are unique. Baja silver belt buckle set w/ ruby mounts on the lugs. Baja 1' / 25.4mm.... starting at.... 425 USD for sterling silver. Years ago I made lots of rings. I made this one for myself. It's a bit worn. The stone is a harlequin opal triplet...rather rare . Please share my site with friends who may appreciate it. I respect your privacy. Names, email addresses and phone numbers are kept by me for personal contact and nothing more.